This stunning one bedroom first floor luxury apartment is situated on a complex in the Tomb of the Kings area of Kato Paphos, within easy walking distance to the sea and amenities. 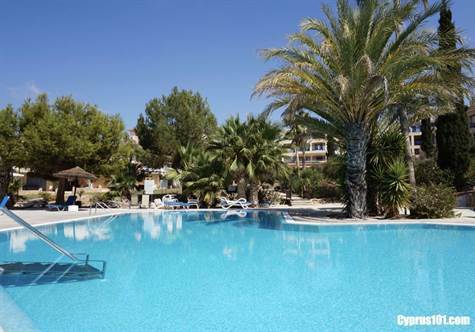 The property is fully furnished and in excellent condition with modern quality finishes. The accommodation features an open plan living room with comfortable lounge and dining area. Through an arch is the kitchen with white fitted units, built-in oven, electric hob and extractor fan, fridge/freezer and washing machine. Off the living room an arch leads to a large double bedroom with fitted wardrobes and a family size bathroom with fitted vanity unit. Sliding patio doors from both the lounge and bedroom provide direct and easy access to an amazing 29 sqm terrace with gorgeous views of the beautifully landscaped gardens and swimming pool beyond. There is plenty of space for both outdoor dining and sunbathing/relaxing. This luxury apartment is certainly something very special and perfect as a holiday home or rental investment. Covered parking is available to the owners and residents and there are full title deeds.